����������� From the Editor: Every year's National Convention is an absolutely unique event. The agenda items, the exhibits, the new friends and business acquaintances: all these give each convention its own character and significance. Some activities lend a luster to the convention in part because they do take place every year and provide helpful fixed points in the whirl of events. In this category are the meetings of the Resolutions Committee and the Board of Directors, the annual banquet, and the many seminars and workshops of the various divisions and committees. Here is a partial list of activities being planned by a number of Federation groups during the 2001 Convention, July 1 through 7. Presidents of divisions, committee chairpeople, and event presenters have provided the information. The pre-convention agenda will list the locations of all events taking place before convention registration on Monday, July 2. The convention agenda will contain listings of all events taking place beginning that day. ����Expanding on our very popular stable tour in Atlanta, our plan for Philadelphia is horses and more horses. Beginning on Monday with miniatures, we'll progress through the week to Thursday's tour, in which we will meet powerhouse draft horses. On Monday, July 2, we're invited to attend the National Association of Guide Dog Users meeting from 7:00 to 10:00 p.m. The Guide Horse Foundation will be the top item on the agenda. Bring your questions for a spirited discussion of this miniature equine mobility tool. Find out more about horse guides by visiting <www.guidehorse.org>. Tuesday, July 3 (beginning late afternoon and going into the early evening), come for election of officers, snack on local produce, network, share stories, and meet some locals. Hear from advisors from the AgrAbility project. Learn about resources we can tap into to start or expand a career in food and animal production. Find out more about AgrAbility and Breaking New Ground by visiting <agrability.org>. Our Philadelphia Agriculture and Equestrian tour is on Thursday, July 5, 1:00 to 6:00 p.m. We'll travel by horse-drawn carriage to tour the home of the 76 Carriage Company. Come learn the ins and outs of an urban draft-horse operation. Next stop will be the Monastery Stables. Riders of all skill levels are welcome to spend about an hour riding in Fairmount Park for an additional charge of $17. Other tour members will explore nearby gardens. A tour of the Manayunk Brewery will be our third stop. The cost of this tour is $25, including transportation, refreshments, and gratuities. Those planning horseback riding, remember to dress appropriately and add $17. Send no money now, but call, write, Braille, or email to reserve your spot. Reservations will be accepted up to Monday, June 18, 2001. Prices are subject to change. We will try our best to satisfy all respondents. Find out more by visiting <www.phillytour.com> and <www.manayunkbrewery.com>. ���To make your reservations, contact the Agriculture and Equestrian Interest Group. We can also provide more information and assistance finding like‑minded roommates. Contact President and Riding Instructor Diane Starrin, (530) 223‑9084, 1042 Hawthorne Street, Redding, California 9602; or tour organizer and aquaculturist Fred Chambers, (760) 505‑8500, email: <regenerative@earthlink.net>. ����If you like asking questions or if you want a career in which you don't know what awaits you when you arrive at the office, then don't miss the annual meeting of the Blind Professional Journalists. We will meet July 3 from 1 p.m. to 5 p.m. at the Philadelphia Marriott. See the convention agenda for the meeting location. We are working on arrangements including an interesting, provocative speaker. So keep reading the Braille Monitor for the latest news. ����If you have any questions or suggestions, please contact Elizabeth Campbell at (817) 738‑0350; e‑mail <liz@star‑telegram.com> or <elizabethcampbell@hotmail.com>. You may also contact Bryan Bashin at (916) 441‑4096; e‑mail <bashin@calweb.com>. 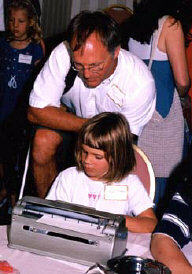 Rob Sweeney of California works with daughter Kyra on a Braillewriter at the Braille Carnival. At this year's Braille Carnival on Sunday, July 1, from 10:00 a.m. to 1:00 p.m., children ages five and up will have an exciting opportunity to use Braille skills to play innovative and fun games. We will have activities for everyone, including sighted siblings and friends. ����The Braille Carnival will be housed in two rooms, one for children who like louder, more energetic games and one for children who prefer to play in a quieter setting. Games and activities will be sponsored by various affiliates and agency participants at the convention. If your group would like to sponsor an activity, call Melody Lindsey at (616) 327‑3516. ����This will be the best Braille Carnival yet. So tell your children to get ready to have a lot of fun and learn more about the value of Braille. ����At this year's convention we will continue to work on our Capital Campaign. Campaign staff and experienced volunteers will meet with individuals as requested. Information will be available in the exhibit hall. The Wall of Honor will be present for conventioneers to examine, and several meetings are scheduled on the agenda for people to learn more about the process and to become more involved themselves. Meetings are as follows: Sunday, 2:00 p.m.; Monday, 11:00 a.m.; Monday, 3:00 p.m.; Wednesday, Friday, and Saturday, 12:30 p.m.; Thursday, 2:00 p.m. Bring your suggestions and learn about the experiences of others. ����Thursday morning at 8:00 a.m. Joe Ruffalo invites all Lions to meet with him, and on Friday morning at the same time Charlie Brown will meet with interested Kiwanians. The groups will discuss soliciting capital gifts from these service organizations. So, if you are a member of either of these organizations, mark your convention schedule to attend this important gathering. � At the National Board meeting on Tuesday morning, July 3, some of the final results of the 2001 Associate Contest will be announced. In addition the drawings for $2,100 in cash prizes will take place. ����Come one, come all. Volunteers will be available on Wednesday, July 4, at noon to work with anyone who has questions about this program. Our publication is the Associate Raiser (regular print or tape), and anyone who wishes to receive it should contact us at (573) 445-6091 evenings. ��� Newsletter editors and other interested people are invited to this meeting, emphasizing good grammar and punctuation, layout recommendations, newsletter content, the fine points of editing, and lively discussions about content. The meeting usually takes place on the evening of Board Meeting Day, so check the convention agenda for time and place. 8:00 p.m. to 9:30 p.m. guest speakerPhiladelphia areaprovided by regional office of Helen Keller, subject: Deaf‑Blind concerns. 7:30 p.m. to 9:30 p.m. guest speaker--back by popular demand--Dr. Sandra L. H. Davenport, M.D., medical geneticist specializing in deaf‑blindness; Subject: The Genetics of Deaf‑Blindness, Presented in a Language Everyone Can Understand. ����Renewal of annual dues in the amount of $5 payable to the NFB Deaf‑Blind Division should be mailed to Wendy L. Carter, 1457 East 700 South, Provo, Utah 84606. For additional information, to communicate special needs for the seminars, and to request additional information about the use of FM units for the convention, contact Joseph Naulty, President, Deaf‑Blind Division, (561) 753‑4700, <jbnaulty@adelphia.net>. ����At the 2001 convention of the National Federation of the Blind in Philadelphia, our Diabetes Action Network will conduct its seminar and business meeting on Tuesday, July 3, from 1:30 to 4:00 p.m. We will hear a presentation about a new talking device providing information on any prescription medication (insulin included), and an insulin pump company representative will also be present. ����Our keynote speaker will be a diabetes educator who will answer diabetes questions and discuss adaptive equipment for blind diabetics. Once again we will enjoy our Make-the-President-Pay diabetes quiz, and President Ed Bryant says he will give a nice donation to the Division for each right answer. Our seminar is free and open to the public. Its location will be posted in the convention agenda. ����During the convention educators of blind children will get together for an informal meeting. This is a great time to meet each other, share ideas and concerns, or just talk. We don't yet have a day or time, but please contact Gail Wagner (505) 237‑0544 or e‑mail <swagkat@worldnet.att.net> to let me know if you would like to be a part of this group. ����In accord with long‑standing tradition, the first meeting of the 2001 convention will be the Emergency Preparedness Seminar conducted by the NFB Ham Radio Group. The seminar will be held at 7:30 a.m. on Sunday, July 1. We will discuss frequencies to be used during the convention and especially those to be used in the event of an emergency call‑out during the convention.������ We will also discuss the architectural features of the convention hotel(s) and other information that NFB hams need to know if an emergency response is necessary. ����Any Philadelphia hams willing to do a little frequency scouting before the convention are asked to contact Curtis, KA0VBA, (303) 424‑7373, <ka0vba@dimensional.com>. ����Last year the Ham Radio Group began a service project to serve the Federation by handling the distribution of the special FM receivers to allow hearing-impaired conventioneers to hear a signal directly from the public address system, which is much easier to understand than the sound that normal hearing aids pick up in a meeting. These same receivers are used to allow Spanish speakers (those who do not understand English fluently) to hear a Spanish translation of the convention and the banquet. ���We will take some time at the Emergency Preparedness Seminar to prepare for this project this year. It is important that all group members willing to help come to the seminar. The annual business meeting of the NFB Ham Radio Group will be held at noon on Friday, July 6. Contact D. Curtis Willoughby, KA0VBA, President, 7775 Quail Street, Arvada, Colorado 80005‑3455, <ka0vba@dimensional.com>, Phone: (303) 424‑7373. ����Each year at our National Convention the National Federation of the Blind Human Services Division meets during the afternoon following the National Board Meeting. Through a series of presenters we examine how blindness affects us as practitioners or aspiring professionals in the various human-service fields. ���This year's program will be the usual lively and challenging fare, kicked off by a keynote speech from long‑standing president Doug Elliott. As always those in attendance will help to chart the future of blind professionals in the various human services areas. Please plan to attend. The meeting begins at 1:30, and the agenda will be packed for the entire afternoon. Don't miss it! ����The NFB Technology Department is pleased to announce 2001: An Internet Odyssey. This exciting and timely adventure will set sail from the Philadelphia Marriott Hotel, Sunday afternoon, July 1. Our scheduled departure time is 2:00 p.m. Passengers may begin boarding at 1:45. We are scheduled to return to port at 5:00. ����The Technology Department crew is planning this journey, which will visit many practical and useful--and even some exotic ports of callon the World Wide Web. As always we will address those in our audience who are new to the Internet. We also intend to travel beyond the ordinary. Today's generation of screen readers allows more complete access to previously inaccessible Web pages than ever before. ����So get out your passport, consult the pre-convention agenda for departure location, and plan to join us on Sunday afternoon. ����The NFB's highly successful Job Opportunities for the Blind program will once again sponsor a job seekers' seminar from 1:00 p.m. to 4:00 p.m. on Sunday, July 1. The specific room at the Marriott will be listed in the pre-convention agenda. If you are looking for work and want helpful guidelines and hints about the job search from those experienced in the process, you will not want to miss this annual event, planned and conducted by JOB regional site coordinators at our Federation training centers. Those attending the seminar will also be given the opportunity to register for JOB Fair 2001, to be held Thursday, July 5, from 2:00 to 5:00 p.m. Participants will have the opportunity to visit recruiters from public and private employers who are looking for qualified applicants to fill positions in a wide range of job categories. Last year's JOB Fair was a huge success, and we look for a great year in the City of Brotherly Love. Consult your agenda for the specific room at the Philadelphia Marriott where the action will occur, and make your plans to attend. ���The Louisiana Center for the Blind Players present In Everything That Matters, a musical tribute to the leaders and members of the National Federation of the Blind. Featuring many original songs and several old standards, this original play by Jerry Whittle depicts memorable moments in the history of our movement. All proceeds from this play go to support the summer training program for blind children at the Louisiana Center for the Blind. Admission is $5. There will be two performances--7:00 and 9:00 p.m. on Tuesday evening, July 3. ���As in past years the leadership of NABICF is planning an exciting and insightful seminar that will further address the needs of blind people who are part of religious communities. The theme for this year's seminar is "Angels of Healing and Care." Among the people who may speak at the seminar are Leigh Scott, who has successfully published a large-print version of the 1991 Broadman Hymnal through a contract from the Southern Baptist Convention, and a member of the National Organization on Disabilities, who will give us further insights on how we can guide our places of worship to be more inclusive. Barbara Pierce, President of the Ohio affiliate, will speak to us about her work in the Episcopal Church. This year is also an election year for NABICF. ���We are making plans to sell a religious keepsake such as the praying hands. I think that such an item would be both valuable and unique for everyone to have. The members and leadership of NABICF look forward to seeing everyone for what should be an exciting convention in Philadelphia. ���If you are interested in starting your own business, what should you do first? What is a business plan, and how do you write one? What are the legal hoops through which you should jump, and how long does all this take? Where do you look for financial backing, and how long will it be before you are actually in the black? If you are a serious entrepreneur or if you have aspirations in that direction, come and join the National Association of Blind Entrepreneurs for a fact-filled, hands-on seminar packed full of opportunities to explore starting or improving your own business. ����If you want to participate in this activity, you must preregister with Marie Cobb at 202 South Augusta Avenue, Baltimore, Maryland 21229, (410) 644-6352 or at <cobbmarieantoin@AOL.com>. ����This seminar will be held on Sunday, July 1, beginning with sign-in at 9:00 a.m. and ending at 4:00 p.m. You will want writing materials, and you will need specific ideas about the kind of business for which you are interested in writing a business plan. ����The $5 fee for attending this seminar will help provide materials. We are limiting the number of participants to fifty. A word to the wise, as they say, should be sufficient. Please specify print or Braille materials when you preregister. ����All Federationists with an entrepreneurial spirit are also cordially invited to attend the annual meeting of the National Association of Blind Entrepreneurs. A panel of successful blind entrepreneurs will discuss how they operate their businesses. They will address issues such as the dos and don'ts of business ownership, the personality traits and skills required for success, and the nuts and bolts of being your own boss. ����We will also discuss establishing an advisory board to help promote entrepreneurship in the blind community. Those who have good ideas about fund-raising for the division should also explore those ideas and bring them to the meeting in writing. We are on the movecome join us. Have loads of fun and gain lots of useful knowledge. ���We will staff a booth in the exhibit hall where division members with established businesses will be available to answer questions, give demonstrations, and distribute any literature they have to offer. Fifty-fifty tickets will be available for sale there. Stop by and visit. The National Association of Blind Lawyers will sponsor its fourth annual mock trial at the 2001 Convention. This trial will reenact an old Federation case. Federation lawyers will be pitted against each other arguing the merits of the two positions. ��We will revisit the ValleyFair Amusement Park case from the early 1990s, in which nine Federationists were told that they couldn't ride the rides at ValleyFair in Minnesota unless each and every one of them was accompanied by a sighted person who could be responsible for them. A complaint was filed against the amusement park, and litigation ensued. This case was never tried to a jury because the parties negotiated a conclusive settlement, but the mock trial will assume that the case eventually went the whole route. See your favorite Federation lawyers strut their legal stuff. ���You, the audience, will serve as the jury. This year's trial promises to be as entertaining and thought-provoking as the past trials. A nominal charge of $5 per person will benefit the National Association of Blind Lawyers. The trial will take place on Monday afternoon, July 2, at 4:30 p.m. somewhere in the convention hotel. Consult the convention agenda for the exact place. As the Philadelphia Convention draws near, we in the National Association of Blind Lawyers are preparing to have some great activities in the City of Brotherly Love. First I would like to invite all of you to join us in Philadelphia to take part in the largest meeting of blind lawyers and legal professionals held anywhere in the country. The National Association of Blind Lawyers will meet Tuesday, July 3, from 1:00 to 5:00 p.m. at the Marriott as part of the sixty-first annual convention of the National Federation of the Blind. ���We will discuss many exciting topics on that afternoon. Drawing on their expertise, lawyers will give an update on the current status of laws affecting the blind. We will hear reports on various advocacy matters in which the Federation has been involved throughout the last year. We expect that officials from the American Bar Association, Pennsylvania Bar Association, and Philadelphia Bar Association will address the group about what's new and exciting in the organized bar of the nation and of Pennsylvania. Experienced practitioners will offer strategies on how best to conduct various types of cases. ���We will share strategies and techniques on how to secure the best possible job in the legal field. We expect to hear from online legal research company representatives about the latest developments in online research and how the blind can access this important research tool. We will have a discussion about the Constitutional challenges being brought by states against the ADA, Section 504 of the Rehabilitation Act, IDEA, and other similar federal laws. We expect to have guest speakers from the United States Department of Justice, Equal Employment Opportunity Commission, and other federal agencies. This and much, much more will take place at our annual meeting in Philadelphia. ���As NABL President I am also pleased to announce that we will be hosting our fourth annual reception after the NABL meeting for blind lawyers, law students, and legal professionals. This reception will give us the opportunity to get to know each other and share ideas. Blind law students will be able to learn how their predecessors did it. Practicing professionals will learn new tips from their colleagues. ���With our regular meeting, the mock trial, and the reception, the National Association of Blind Lawyers plans to be busy in Philadelphia. Make your plans now and join us there. ���The National Association of Blind Merchants will hold our annual membership meeting on Tuesday, July 3, from 1:00 to 5:00 p.m. with registration beginning at 12:30 p.m.
���This year we are also hosting a reception on Thursday, July 5, from 7:00 to 10:00 p.m. We are inviting everyone, young or old, who may wish to know more about the Randolph‑Sheppard or Business Enterprise Program and to visit with successful blind merchants and BEP state-agency administrators. There are many myths and misconceptions about the Business Enterprise Program, but the facts are that there are many lucrative opportunities for energetic, business-minded blind people. Learn more at the National Association of Blind Merchants Randolph‑Sheppard Reception. ���The Music Division has an exciting agenda planned for this year's convention. First let me say that our new name is the National Association of Blind Musicians. 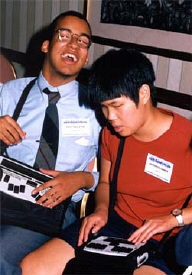 We are planning to conduct a seminar Sunday, July 1, for students and parents on Braille music. Here's your chance to get an introduction to the Braille music code and ask questions. ���Our annual meeting will be Monday, July 2, and will feature a presentation of Good Feel by Bill McCann. The annual Showcase of Talent will be Wednesday, July 4. Participants should follow these guidelines: 1. Sign up by 12 noon on the day of the Showcase. 2. Perform one number no longer than four minutes. 3. If you are using a taped accompaniment, please have it cued up. Do not sing with the artist; you will be cut off while performing. 4. If you need live accompaniment, please make arrangements before the Showcase. If you wish to register for the Showcase before the convention, contact Linda Mentink, 1740 Tamarack Lane, Janesville, Wisconsin 53545, (608) 752-8749. ���If you wish to renew your membership or become a member before convention, please send dues of five dollars to Theresa Moore, 104 Xit Ranch Road, Trinidad, Texas 75163. Please make checks payable to NABM. ���On Sunday, July 1, 2001, the National Association of Blind Secretaries and Transcribers will hold its annual meeting at the Philadelphia Marriott. Registration will begin at 6:30 p.m. with the meeting beginning at 7:00 p.m.
���Topics for this meeting include changing the name of the Division to National Association of Blind Office Professionals, revising the constitution to reflect the name change and other things that need to be modified, a presentation by a speaker from an adaptive technology company that markets tutorials for the blind community, and other items brought to the floor by individual members. ���Membership dues are $5 a year. Anyone wishing to pay dues in advance of the convention can send a check to Carol Clark, Treasurer, 10 Summitcrest Drive, Kansas City, Kansas 66101. You can reach her at (913) 621‑3551. ���For more information about the National Association of Blind Secretaries and Transcribers, contact Lisa Hall, 9110 Broadway, Apt. J102, San Antonio, Texas 78217, or call (210) 829‑4571, or send email to <lehtex@concentric.net>. ���The National Association of Blind Secretaries and Transcribers officers are Lisa Hall, President, San Antonio, Texas; Janet Triplett, Vice President, Tulsa, Oklahoma; Renee Zelickson, Secretary, Birmingham, Alabama; and Carol Clark, Treasurer, Kansas City, Kansas. See everyone in Philadelphia. ���The annual meeting of the National Association of Blind Piano Tuners will be held on Tuesday, July 3, at 3:00 p.m. Please consult your convention agenda for room location. Annual dues are $10. If you are unable to attend our meeting, you may send your dues to Connie Ryan, Treasurer, 56 N. Extension Rd., #138, Mesa, Arizona 85201, (602) 890‑8061. ���The National Association of Guide Dog Users will again have two meetings during our convention in Philadelphia. The first meeting will take place Sunday, July 1. Registration will begin at 6:00, and the meeting is planned from 7:00 to 10:00 p.m. This is the business meeting for the division. We are offering preregistration for those who are already members of the division. Those who attended the meeting last year will remember the long line for registration. If you wish to avoid this line, please send your preregistration information to Priscilla Ferris as soon as possible after you receive the form from her. Mail your completed form to Priscilla at 140 Wood Street, Somerset, Massachusetts 02726. Please include your $15 dues. Priscilla will publish more details in the next issue of Harness Up. ���As it did last year, the second meeting will consist of two parts: one for those interested in learning more about guide dogs and one for experienced guide-dog users. As part of the division's continuing effort to educate potential guide-dog users, we will be asking guide-dog instructors to offer Juno walks again this year. For those who don't know, this procedure involves an instructor simulating a walk with a guide dog. This is the walk given to every student before matching a person with a dog. Some of the schools may bring dogs as well, but we never have advance knowledge of this. The meeting for potential guide dog users will be from 6:00 to 8:00 p.m. on Wednesday, July 4. ���Wednesday from 8:00 to 10:00 p.m. is the experienced-guide-dog-users seminar. As usual we will present many exciting topics for all our meetings. One major topic of our business meeting will be the Guide Horse Foundation and our resolution being presented opposing it. We are inviting the members of the Agriculture and Equestrian Group to participate with us. Although the Guide Horse Foundation is new and has not yet completed training its first full‑time graduate, the organization has received extensive publicity, which we believe to be harmful to the image of blind people. The organization also represents trends toward exotic and unnecessary solutions for providing services and toward unqualified people wanting to provide those services. ���Another topic planned for the business meeting is Southeastern Guide Dogs' training program for blind wheelchair users. This is a relatively new program, and our own president, Suzanne Whalen, will possess firsthand knowledge of the program by convention time. As most of you know, Suzanne is scheduled to attend Southeastern to learn to work with her dog Caddo using a power wheelchair. ���Other topics are being planned, but final arrangements have not yet been completed. We believe that you will like this year's topics, and we look forward to seeing as many of you as possible at the meetings. ���Our National Convention is coming soon, and NAPUB has planned some interesting activities this year. On July 1, at 2:00 p.m., we will sponsor a forum on the Unified Braille Code (UBC). Ms. Eileen Curran, the president of the Braille Authority of North America (BANA), will present specific information about the history of the UBC and possible changes to the Braille code. This will be a time for people to ask questions and learn more about the UBC. Everyone is welcome to attend and voice opinions. ���Our annual NAPUB meeting will take place at 7:30 p.m. on Tuesday, July 3. We will discuss some exciting and positive changes in the "Braille Readers Are Leaders" Contest. Getting Braille laws passed in all states continues to be a high priority for all of us, so we will hear reports on our most recent successes. Also we will hear about new technologies affecting Braille. As always this meeting will be lively and interesting. We urge all of you to come and share your ideas with us. We look forward to seeing you there. ���If you have questions about either of these meetings, contact Nadine Jacobson at (952) 927‑7694, or write to me at 5805 Kellogg Avenue, Edina, Minnesota 55424. Braille is important to all of us; let's work together to ensure that it continues to be accessible and useful to all blind people. ���Students on the National Association of Blind Students listserv have already been talking about and preparing to attend the National Convention. This year's seminar will address issues blind students currently face and present speakers that lead to thought‑provoking discussions. Some of the topics to be covered include the resolution regarding guidelines for disabled student service offices, electronic and digital text, standardized testing, plus much more. Come see what the talk is all about at the NABS seminar on Monday, July 2, from 7:00 to 10:00 p.m. Registration will open at 6:00 p.m. with a $5 registration fee. ���Last year we found out how much fun it is to eat ice cream with Dr. Maurer. Buy a raffle ticket and try for a chance to share in this experience. Dr. Maurer has set aside a specified time on the evening of Thursday, July 5, to converse and eat ice cream with the winners from this NABS-sponsored raffle. Those who are not eating ice cream with Dr. Maurer on Thursday should get their poker faces ready and join the National Association of Blind Students from 8:00 p.m. to midnight at Monte Carlo Night. Come face the sharkscard sharks, that is! Card games of all types will be played, and good fun will be had by all. Cash prizes will be awarded to the first-, second-, and third‑place winners. ���Students who are attending the convention for the first time as well as younger blind children will have the opportunity to be matched with NABS mentors. For the second year NABS is working in conjunction with the National Organization of Parents of Blind Children (NOPBC) to offer a mentoring program. Mentoring can take place during the convention as well as through correspondence after the convention. So if you would like to ask questions of and spend time with a competent blind student with a positive attitude about blindness, come sign up at our booth at the NOPBC event Sunday, July 1, from 8:00 to 10:00 a.m. You can also come and have fun with us at our booth at the Braille Carnival later that day. ��������� During convention week children between the ages of six weeks and twelve years are invited to join in the fun and festivities of NFB Camp. NFB Camp offers more than just childcare; it is an opportunity for our blind and sighted children to meet and develop lifelong friendships. Our activity schedule is filled with games, crafts, and special performances designed to entertain, educate, and delight. If you are interested in having your children participate in this year's program, please complete and return the registration form provided. Pre-registration with payment on or before June 15, 2001, is mandatory for participation in NFB Camp. Space is limited, and last year some families had to be turned away. ���About the Staff: NFB Camp is organized and supervised by Carla McQuillan, the Executive Director of Main Street Montessori Association, operating two schools, parent-education courses, and a teacher-training program. Carla is the mother of two children, the President of the National Federation of the Blind of Oregon, and a member of the Board of Directors of the National Federation of the Blind. ���Michelle Ros is this year's Activities Director for NFB Camp. Michelle is a Montessori teacher employed by Main Street Montessori Association. Carla and Michelle will supervise a staff of experienced childcare workers and volunteers. ���Activities and Special Events: The children are divided into groups according to age: infants and toddlers, preschoolers, and school-aged children. Each camp room is equipped with a variety of age-appropriate toys, games, and books; and children will enjoy daily art projects. Blind teens will come in to read stories in Braille, and the National Association of Guide Dog Users will make a presentation. 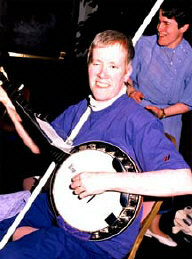 We will sing, dance, and play instruments with blind singer/songwriter Daniel Lamonds. In addition, the school-aged children will make excursions to the Farmers' Market and the Please-Touch Museum. On the final day of NFB Camp we will conduct a big toy sale--brand new toys at bargain prices. ���Banquet Night: NFB Camp will provide dinner and activities during the banquet. 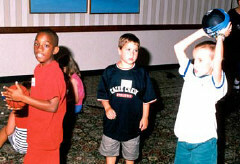 The cost for banquet activities is $15 per child in addition to other camp fees. Monday, July 2, Camp is closed. Wednesday, July 4, 9:30 a.m.-12:30 p.m.
Friday, July 6, 8:30 a.m.-12:30 p.m.
Saturday, July 7, 8:30 a.m.-12:30 p.m.
����������� * You are required to provide lunch for your child(ren) each day. ���These times may vary, depending on the timing of the actual convention sessions. NFB Camp will open thirty minutes before the beginning gavel and close thirty minutes after session recess. ���Fees: for the entire week (including banquet), first child $80, siblings $60 each. By the day, each child (does not include banquet), $20; banquet, $15 per child. ���Please use the NFB Camp pre-registration form provided. Include description of any disabilities we should know about. Completed pre-registration form and fee must be received by June 15, 2001. ����������� Make checks payable to NFB of Oregon and mail to National Federation of the Blind of Oregon, 5005 Main Street, Springfield, Oregon 97478, (541) 726-6924. ���The 2001 meeting of the National Federation of the Blind in Computer Science will be held from 1:00 to 5:00 p.m. on Tuesday, July 3, at the Marriott Hotel. ���This year we will make a special effort to address issues of interest to blind computer programmers and other blind professionals employed in information technology. We plan to organize a panel of blind programmers who develop software for Windows and other PC-based operating systems. Linux has become a topic of interest of late, and, if we can find the right people to talk about it, there will be a program item on it at the meeting. Some of the more interesting technical intricacies of Windows will be revealed, and we may even have a program item on how a blind person can use America Online without the mouse. ���Of course annual meetings of the NFB in Computer Science represent an ideal time for people to renew their membership in the organization. Our membership dues are $5, and, while we are not holding an election of officers this year, we will be talking about issues in which the organization should take an interest. For example, what should we do about PC-based development tools, which have proved to be quite unfriendly with screen-access technology for the blind? Should we go after some of the major companies who make software-development tools? How can we work to make the training programs for information technology professionals more helpful to a blind person who wants to enter the field? ���Meetings of the NFB in Computer Science are a great time to talk tech, exchange information about technical issues, and meet experienced blind people who have made their mark in information technology. If you want to learn more, contact Curtis Chong, President, NFB in Computer Science, 1800 Johnson Street, Baltimore, Maryland 21230; phone: 410-659-9314, extension 349; email: <CChong@nfb.org>. ���Each year NFB NET, the official bulletin board system of the National Federation of the Blind, continues to expand and add new services. Two years ago we added access to our large collection of files by FTP or a standard Web browser such as Microsoft Internet Explorer, Netscape, Lynx, and the like. Last year was no different. We added access to our large message base by the World Wide Web. This means that you can now use your browser to look at an archive of messages which have been posted to one of our twenty-one mailing lists, going back to March 1999. This year we have continued to expand by adding several new mailing lists. To learn how to use this Web archive of messages or how to Telnet, FTP, or use your browser to access NFB NET, files, or our mailing lists, attend the 2001 NFB NET training seminar. It will be held on Sunday, July 1, from 9:00 a.m. until noon. See the pre‑convention agenda for location. ���The National Organization of Blind Educators will meet in Philadelphia this summer at the annual convention of the National Federation of the Blind. This is the only opportunity blind educators will have this year to meet and share ideas with other working educators. Come and make the contacts which will help you to be successful in your endeavor to work in the field of education. See you on July 3, 2001. ���The National Organization of the Senior Blind will be holding its annual division meeting on Monday evening, July 2, from 6:30 to 10:00 p.m. Plan to be there at 6:30 because we will be registering people and collecting annual membership dues in the amount of $5. We want to get your name and address on our mailing list so you can receive our newsletter and other announcements and publications as they become available. ���We are beginning to put together our agenda, which will include entertainment by some of our seniors, an update from our Washington representative on legislation affecting the older blind, and comments from seniors representing different areas in our nation and how they are reaching seniors who are losing their vision. There will also be information on our senior leadership seminar held in early January at the National Center and information on the low-vision sampler kit. The exact room location will be announced in the convention agenda. ���Please come and join us for a fun-filled and informative meeting. If you have any questions regarding the Senior Division or the annual division meeting, contact Christine Hall, President, at (505) 268‑3895; Ray McGeorge, Vice President, at (303) 321‑4268; or Paul Dressell, Treasurer, at (513) 481‑7662. ���Come participate in the Science and Engineering Division activities at National Convention in Philadelphia. Once again our division meeting appears in the convention agenda at a time different from the NFB in Computer Science meeting so that people can attend both meetings. The division meeting is shaping up to be a very exciting one. If you are a student with a nontechnical background and a dreaded science or math course in your future, you won't want to miss our seminar on making science and math classes easy. Also come learn about the innovative careers division members have found using their technical training. ���RSVP to the Science and Engineering Networking Breakfast 7:00 a.m. Wednesday, July 4. We will meet at Starbucks Coffee in the lobby of the Philadelphia Marriott for bagels, java, and good company. To RSVP contact John Miller by e‑mail: <jmiller@ucsd.edu>, phone: (858) 587‑3975, or mail: 8720 Villa La Jolla Drive, #118, La Jolla, California 92037. ���An outreach seminar (Social Security and Supplemental Security Income: What Applicants, Advocates, and Recipients Should Know) will take place on Thursday afternoon, July 5. The purpose of this seminar, which will be conducted jointly by the National Federation of the Blind and the Social Security Administration, is to provide information on Social Security and Supplemental Security Income benefits for the blind. Seminar presenters will be Jim Gashel, Director of Governmental Affairs for the National Federation of the Blind, and a representative to be announced from the Social Security Administration. Attention all teens. This year a Teen Hospitality Room will be open during the week of the convention. It will be a place to hang out, meet new friends, spend time with old friends, play games, eat snacks‑-have fun! Look for flyers announcing the days and times on information tables during the NOPBC workshops, or contact Gail Wagner's room at the hotel. ���Adults, we need volunteers to help supervise the room. If you can help for a couple of hours, please call Gail Wagner, (505) 237‑0544 or e‑mail <swagkat@worldnet.att.net>. ���The annual Writers' Division meeting will be held on Tuesday, July 3, between the hours of 1:30 and 4:30 p.m. The Division is currently conducting Writers' Contests in short story fiction and poetry for both adults and children. Entry deadlines are June 1, 2001, and more information can be obtained by contacting Tom Stevens (for fiction) at (573) 445-6091 and Lori Stayer (for poetry) at (516) 868-8718. Winners of the contests will be announced at the annual meeting and cash prizes awarded. The division also publishes a quarterly magazine, Slate & Style, in Braille and large print and on tape and by email. Inquire as above. The Division will conduct no additional workshop at this convention, but the Division meeting program will include several presentations by writers on various subjects, and everyone is welcome.